Configure SSL/TLS for a DataStax Enterprise (DSE) cluster using a Lifecycle Manager (LCM) Config Profile. This is the recommended procedure for a production environment. LCM can configure DSE clusters to use either node-to-node or client-to-node encryption. Client-to-node encryption is enabled by default, and can use certificates generated by the internal certificate authority in LCM, or certificates generated outside of LCM. Node-to-node encryption is enabled by default, but can be configured by enabling internode communication. The keystore file used for DataStax Agents to communicate with DSE nodes is exactly the same as that used by a DSE node connecting to other DSE nodes. The keystore file used for the OpsCenter daemon communicating with DSE nodes is automatically generated by the LCM configuration process and put under the folder /var/lib/opscenter/ssl/lcm. For information about manually configuring cluster connections (using the OpsCenter UI), see Editing OpsCenter cluster connections for authentication or encryption. Review the LCM documentation for Configuring DSE security using LCM. Important: When enabling node-to-node encryption on an existing cluster, the cluster will experience a network partition during the transition, leading to temporary loss of consistency. If possible, choose whether to employ node-to-node encryption when first creating the cluster. Note: Enabling require_client_auth for client_encryption_options requires special steps due to an LCM limitation. For more information, refer to this Knowledge Base Article. In the Security pane under server_encryption_options, select one of the following options for internode_encryption. dc: Traffic between datacenters is encrypted. Select this option if there is concern about a performance impact of encrypting traffic locally, but encryption is still required for inter-datacenter traffic that might transit untrusted links. rack: Traffic between racks is encrypted. Tip: For more details about available configuration options, see server_encryption_options. Re-enter keystore and truststore passwords for confirmation. In the Security pane, select the enabled option for client_encryption_options. 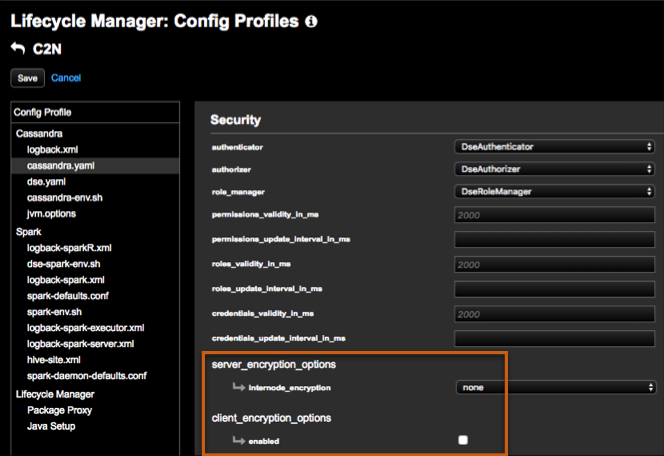 Tip: For more details about available configuration options, see client_encryption_options. Go to the Clusters workspace in Lifecycle Manager and select the configuration profile to apply at the cluster level. If an install job has not been run yet on the cluster, Run an Install Job. Otherwise, Run a configure job to apply the configuration profile changes. Monitor the job. When the job completes successfully, SSL/TLS setup for the DSE cluster is enabled. Download the generated CA cert for use with the DSE client SSL connection.